The ABSOLUTELY BEST place to go for your first camping trip. If you find any dead links on this page, please let me know. Howdy friend - come on over - pour yourself a mug of coffee - pull up a stool and sit a spell. It's kind of cozy over here; the fire is not too big and you can get close enough to stay warm. I've been camping since 1953 - when I was in Boy Scouts. I've learned a lot since then - a lot from my Scoutmaster, Andy Hoigard and a lot from experience... and I'm still learning. I'd like to share some of what I've learned - not all of it, some stuff you have to learn on your own. Maybe I can learn a few things from you. If you've never been camping before, mosey on over to that link for the best place to go on your first trip. You'll find it interesting. It is my opinoin that camp grub should not be limited to hot dogs, hamburgers and the like. To me a camping trip is time for recreation and one form of recreation (to me, anyway) is cooking. With no hectic schedule to adhere to, there is plenty of time to whip up some great chow. I put a few of the recipies I use on my cooking page. Actually, anything you can cook at home can be cooked in camp and the fresh air encountered while camping enhances the flavors of all foods. Speaking of camp chow - take a look at my camp kitchen. There's more to camping than just sitting around the campfire talking and eating. 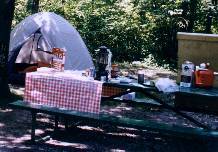 Here you'll find a few other things to do while camping. Be sure to read my views on camping and the environment. Send me your comments Go back to "Paul's Place"
Site is owned by Paul's Camping Page.